Stainless steel case with a stainless steel bracelet. Uni-directional rotating bezel. Black dial with luminous silver-tone hands and index hour markers. Minute markers around the outer rim. Dial Type: Analog. Luminescent hands and markers. Day of the week and date display at the 3 o'clock position. Seiko caliber 7S26 quartz movement. Scratch resistant hardlex crystal. Screw down crown. Solid case back. Case size: 38 mm. Case thickness: 13 mm. Round case shape. Band width: 20 mm. Fold over clasp with a safety release. Water resistant at 200 meters / 660 feet. Functions: date, day, hour, minute, second. Dive watch style. Watch label: Japan Movt. 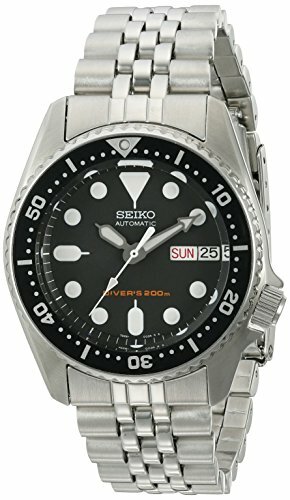 Seiko Black Automatic Diver Men's Watch SKX013K2. Stainless steel case with a stainless steel bracelet. Uni-directional rotating bezel. Black dial with silver-tone hands and dot hour markers. Minute markers around the outer rim. Store: Time Watches 1 Condition: Brand New Price: $218.00 Total Price: $218.00 Buy It from Time Watches 1 No returns. 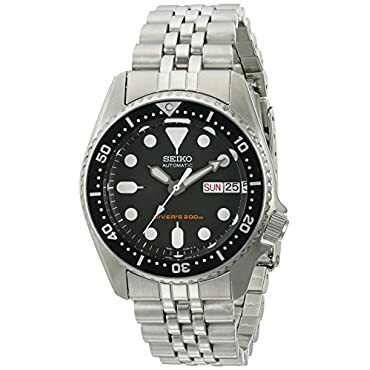 Store: WatchNation America Condition: Brand New Price: $282.79 Total Price: $282.79 Buy It from WatchNation America Want it delivered by Tuesday, April 23? Store: Spot On Times Store Condition: Brand New Price: $299.00 Total Price: $299.00 Buy It from Spot On Times Store No returns.